I am sure that this story will be familiar to many house rabbit owners, but I’d like to share it, as it may make you smile, whether you already have a house rabbit, or are planning to share your home with a bunny in the future. A couple of years ago I made some new friends, and the first time I went to their house, they introduced me to ‘Ace’ their house rabbit. I was amazed that Ace lived in the house, wandered around as he pleased, and even ran up the stairs in the morning to scratch on their bedroom door. I’d had rabbits when I was younger, but they were kept in a hutch and I had very little interaction with them. From that moment, I was determined to have a house rabbit of my own. I pestered my boyfriend for months to get me a rabbit, and eventually he did. When I first set eyes on Herman it was love at first sight. I’d never heard of a Lionhead before, and marveled at his amazing hairstyle! I have since realized that he must be a mix, as he is not as fluffy as many Lionheads. I didn’t know what to expect, but it only took a week or so to litter train him. He was a little nervous at first, but gradually he has become braver. Now I can’t imagine him not being in our home. People are often amazed that we have a house rabbit. Some think it is a little odd, but most think it is great. I regularly give people updates on Herman’s antics. He has developed such a distinct personality. He is a grumpy little rabbit, and has been known to throw his bowl around when he is hungry. We keep him in an area of the kitchen, and he has a baby gate separating him from the rest of the kitchen during the day. When he hears us coming into the kitchen he sticks his head through the bars. Whenever he hears a rustle of a bag he comes leaping and bounding towards the noise, as he knows this means he may get a treat. He also knows his name and will prick up his ears when you call him and run towards you. He loves my fiancé so much, and spends most evenings stretched out on the floor or on the sofa with him watching television, especially football. It is truly amazing what a personality Herman has, and I would take a house rabbit over a cat or a dog any day! Don’t be fooled though, a lot of rabbits hate being cuddled. Even though they look fluffy and cute, many hate being picked up, including Herman. My cousin, a pet store manager, told me that this is because swooping into pick a rabbit up is akin to a big prey animal coming in to grab them. From day one Herman has never really liked being picked up. Now we respect this and don’t even attempt it. He loves being stroked and brushed though, and lies there peacefully with his eyes closed. My favorite moment was when my fiancé asked me if I would like some wine, and opened the fridge. 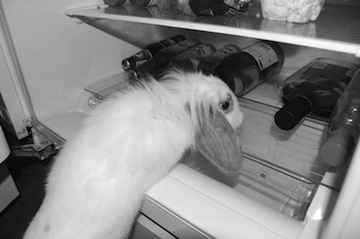 The next thing we knew, Herman was in the fridge and had pulled the wine out for me! Definitely a coincidence but it made us laugh a lot! I love Herman so much, even though he can be hard work and extra expense at times (he has eaten a lot of phone charger wires and expensive pairs of shoes). Getting him was the best thing I have ever done.